OREM – The match was all it was hyped to be, at least for the first 45 minutes. 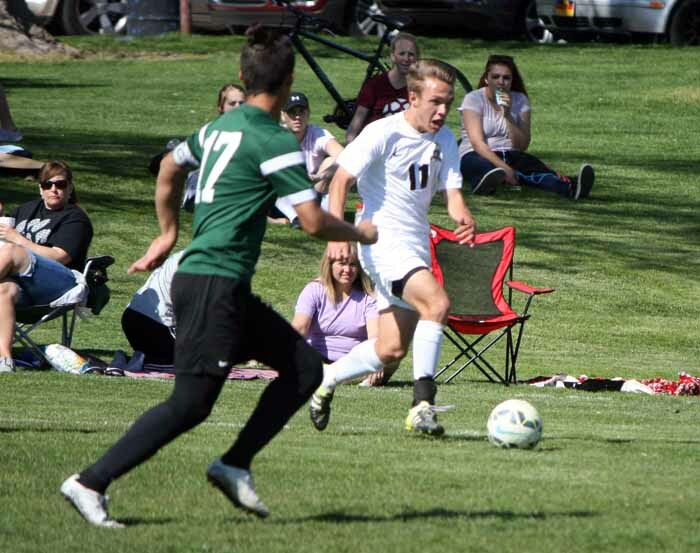 With Region 7-leading Provo visiting second-place Mountain View for a crucial boys soccer tilt Tuesday, the top spot in the league was on the line as two of the state’s elite teams on the pitch. After a first half that featured physical play both ways and a whole lot of back-and-forth action, a scoreless draw turned heavily in favor of the home team during a 16-minute stretch after intermission. The Bruins tallied three times during those 16 minutes and claimed a 3-1 victory that puts them into the top spot in the region, at least temporarily. Mountain View (7-1-2 in Region 7, 10-3-2 overall) has 23 points, but the Bruins still have a bye on their schedule. Provo, on the other hand, has an extra game to play and the Bulldogs (7-1-1, 10-2-1) sit one point back at 22 points. If both teams win out, Provo has the chance to leapfrog Mountain View to claim the league title and the top seed entering the state tournament. Tuesday’s key performance did not show up in the game summary, as Eric Garcia did not score a goal or even deliver a critical assist. What the sophomore midfielder did, however, was man-mark Bulldog superstar Jonathan Ruvalcaba, the No. 2 scorer in Class 4A with 19 goals this season. Every time Ruvalcaba turned around he found Garcia, and often another defender or two just for good measure. The Mountain View approach was to let anyone but the high-scoring striker beat them, and it worked on this particular day. 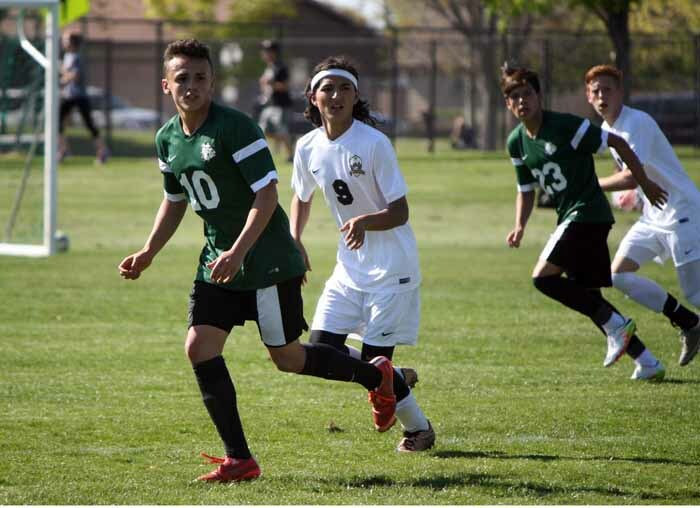 Anchored by center backs Elias Lartey and Kade Hernandez, the Bruin back line was impenetrable until a late foul inside the 18-yard box allowed Ruvalcaba a penalty kick that the senior buried to finally get the Bulldogs on the board. 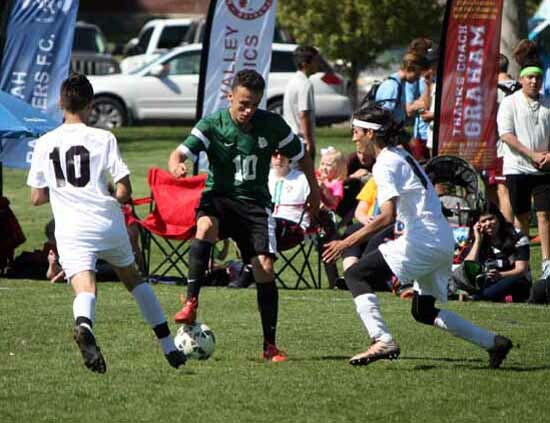 The Bulldogs created a number of opportunities through senior Luis Hidalgo on the left side, but could not generate much in the way of strong scoring chances. That Ruvalcaba score was too little too late for Provo after those three Mountain View goals that put it in position to grab the huge victory and the three points that come with it. The Bruins were most dangerous when they put pressure on the Bulldog defense with quick counters. Much of that was created by Mountain View’s tendency to restart quickly after each stoppage of play. In the 47th minute, Jackson McBride ran onto a well-placed through-ball down the left side and let fly a shot from a tough angle. Provo keeper Gabriel Higginbotham dove and turned the attempt away, but he couldn’t do anything with the rebound. Cristobal Zamarano was the man on a run to the middle of the field who was there to finish off the second chance, and the sophomore buried it into the open side of the net. Up 1-0, Mountain View found the twine again six minutes later once again because it had a player in the right place. This time, Ben Ortiz beat Higginbotham to a ball on the right edge of the penalty area and sent it in the direction of the far post. The Ortiz ball was headed wide of the frame until McBride ran onto it right at the post and redirected it just enough. It appeared his touch may have sent the ball too high, but it found its way beneath the cross bar and into the netting to double the advantage. The third tally came in the 63rd minute as Raul Lievano touched a ball with his back-heel to set up Irvin Valencia. The senior midfielder blasted a shot on goal from about 30 yards out that beat the Bulldog goalie just inside the post to put Mountain View on top by a 3-0 count. The Ruvalcaba penalty kick came in the 80th minute, just before an extended length of stoppage time, but it was all Provo could muster. The Bulldogs will try to get back on top of Region 7 beginning with a cross-town showdown against Timpview (2-7-0, 3-8-1) Friday. They close out the season with a pair of contests next week, at third-place Orem (5-1-2, 8-3-3) Tuesday and at home against Corner Canyon (1-9-0, 1-13-0) Thursday. The Bruins will look to win out beginning Friday at fourth-place Alta (5-3-1, 7-4-2) before closing out their season next Friday at home against Timpview.